When used properly, a pressure cooker will significantly reduce the amount of time you spend cooking — also, no more standing around waiting for your food to be done. Ovens and slow cookers can take hours or even a whole day to cook a meal for you; these pressure cookers complete their task within minutes and still produce the same tasty results. All pressure cookers are different. Some brands make stovetop versions, while others create countertop electric ones. They are all simple to use, but it’s important to pay attention to what type of settings are present on the cooker for you to manipulate while cooking. There could be just a low and high setting, or a multitude of settings from high pressure to slow cook to sauté. Sometimes having more settings is better so that you can rest assured that you will have the ability to use it for every type of recipe, not just for high-pressure cooking. It’s also good to pay attention to the quantity of food the cooker produces. They come in a variety of sizes. A standard sized pressure cooker will usually come in a 4- or 6-quart size, which is ideal for feeding yourself up to a family of 4 people. If you need to be able to make more food than that, a 10-quart pressure cooker is the extra-large size option. Pressure cookers this big hold much more food than the smaller sizes, almost double the amount. It might be excessive for cooking for just yourself since it makes a lot of food, but whatever it is you need that much food for, a 10-qt will do the trick. The first 10-quart pressure cooker we’re going to talk about is the Power Pressure Cooker XL 10-Qt. It has done many people well, as you can see from the 4 out of 5-star rating on Amazon. The reason it has four stars and not 5 is most likely because of a consistent problem with the Teflon coating. In general, it’s better to get a pressure cooker that has a ceramic-coated or stainless-steel inner pot rather than a Teflon-coated one. Teflon has been known to give off certain chemicals into food when the coating flakes off. If it doesn’t start to flake off, then it’s ok and won’t harm you, but the Power Pressure Cooker tends to lose its coating within just the first couple times of cleaning it. One customer said that they didn’t have any problems with the Teflon, that is until they decided to soak the pot before cleaning it which caused the coating to start to quickly disintegrate when scrubbed. Other than the Teflon problem, this pressure cooker has had virtually no issues. It has a digital display with several cook preset buttons on it, including a keep warm mode. The cooker comes with some handy accessories, such as three wire racks, a steamer, measuring cup and a rice paddle. The materials it is made out of are high quality and will last a good while after being purchased. Here is another highly rated 10-quart pressure cooker. The 10-in-1 PressurePro 10 Qt Pressure Cooker is just a little cheaper than the Power Pressure Cooker, depending on the retailer you get it from. If you shop on Amazon, this one’s about $20 or so cheaper. They are both relatively similar to each other in a lot of ways: digital display, cooking preset buttons and stainless-steel outer layer. The main difference between them is that the inner pot in the PressurePro is not Teflon-coated and is instead non-stick FDA grade, PTFE and PTOA free, which are some of the chemicals in Teflon. It’s a 10-in-1, so in other words, it replaces your rice cooker, slow cooker, yogurt maker, egg maker, canner, preserver, sautés, warmer and steamer. It allows you to do all of these things on top of high-pressure cooking. It’s technically a type of multi-pot since there is so much you can make with it. Most other pressure cookers don’t do nearly as much. Next is the Zavor DUO 10-Quart Multi-Setting Pressure Cooker and Canner. Unlike the others, this one goes on your stovetop. It can be used on virtually any stove including gas, electric, ceramic and induction and works great no matter what you’re using. This is not a multi-cooker since the only actions you can do are high-pressure cooking and canning; there are no presets. Although it does have a pressure regulator knob with a high and low-pressure setting, that’s why it’s called a “Multi-Setting” Pressure Cooker. This pressure cooker received just 3 out of 5 stars, unlike the other two pressure cookers, who received 4. Most customers were satisfied with this cooker and said that it lasted quite a while, at least over a year. One of the only problems mentioned is that the pressure regulator knob seems to be made from a cheap type of plastic and may break easily. On the plus side, when you buy this Zavor Cooker, it comes with a free recipe book that has over 50 pressure cooker recipes in it for you to try. Which Pressure Cooker Should You Buy? All 3 of these pressure cookers, the Power Pressure Cooker, the PressurePro, and the Zavor, are recommended by users and got loads of positive reviews online. First, decide whether you want a stovetop pressure cooker or a countertop one, that should narrow it down to at least two if not one. If that brings you to a decision between the Power Pressure Cooker and the PressurePro, the two are very similar to each other. Each has at least one negative aspect about it, so it’s up to you to decide which one will suit you best. If neither of these will fulfill your wants or needs, you can always keep looking for a pressure cooker elsewhere. 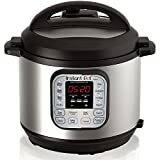 Some other good brands are InstantPot, Breville, and Presto.